Travel enthusiasts have always been on the lookout for a one-stop travel app solution to all the travel-related booking and reservations. Our client was therefore planning to create a unique travel app using which travellers could plan their trips and also manage their bookings easily. More often than not, manual methods of booking are inefficient since advanced features such as mobile confirmation, mobile tickets, multiple choice hotel bookings, cabs for sightseeing, etc. have to be managed by the traveller. Not only that, it can also lead to inaccurate bookings leading to further hassle. Keeping all these points in mind, the customer approached us to help develop a complete travel app which would ease the task of planning a trip. The customer was delighted to see that the travel booking app developed by our team perfectly mirrored his initial requirements. Currently, the travel planning app is immensely successful with thousands of downloads, and offers a complete one-stop solution for travel enthusiasts to make their bookings from anywhere and at any time. Turn Your Mobile App Idea Into Reality with Outsource2india! We, at Outsource2india, have helped many creative app ideas turn into reality with our vast experience in the mobile app development domain. We have an expert team of mobile app developers with the ability to develop apps on various platforms such as Android, iOS, and Windows. Read more about other successful projects handled by our team. If you have a similar app development requirement, feel free to talk to our representatives or fill in the contact form and we will get back to you within 24 hours. 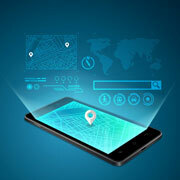 Our mobile application development services have created global success stories.